Can your line following robot move faster than [Usain Bolt] who has been described as “The World’s Fastest Timed Human”? Puma, the athletic footwear, apparel and accessories company, created such a robot to help train their company sponsored athletes. The shoebox-sized robot exceeds [Bolt]’s top speed of 44-km/hour. At that speed, following a line gets tricky. It took the development team 8 prototypes to attain that capability. Inside the BeatBot an Arduino reads 9 infrared sensors for line detection at 100 samples a second. A digital servo controls the Ackerman steering mechanism to follow the line on the track or floor. Wheel encoders provide the data for speed and distance measurement. The user can set the distance of the run and the time to beat. Run pacing can also be adjusted. LEDs on the robot provide the starting ‘gun’ and help the runner see the BeatBot using peripheral vision. Two GoPro cameras, front and rear, provide a visual record of the run. In a market full of Fitbits, Misfits, and Fuelbands, it’s easy to get carried away with sophisticated personal fitness tracking technology. That’s why [André] took a totally different approach with his super simple run tracking device, the C25K machine. C25K stands for “Couch to 5k” which is a slimmed down exercise schedule designed to gradually bring people who have otherwise no exercise routine up to a level of fitness where they can run a 5k in just 9 weeks. To keep participants from wearing themselves out too early, the routine specifies a sequence of running and walking periods to be completed in series on specific days. Though simpler than most fitness plans, it’s still a lot to keep track of especially when you’re sweating so hard you can barely see your stopwatch. 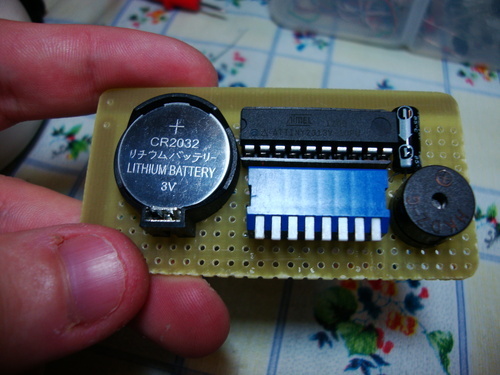 André found a solution using a bare-bones circuit based on the ATTiny2313. After loading the C25k calendar into its firmware (which takes up less than half of its 2K of flash), he needs only to toggle the dipswitch to select the appropriate day of the program, and the little device (scarcely larger than a key fob) will beep to let him know to switch from running to walking or back again. Definitely a great project for any hobbyist looking for a geeky way to get in shape. Last Friday, Friday we caught wind of [gvillenave]’s running accessory inspired by Rebecca Black, and we we we so excited, we so excited to bring this to you on Saturday, which comes after Friday. [gvillenave] came up with the idea of using a song on the annoyance level of “Friday” to encourage a runner into keeping up a good pace. The concept is simple: if the wearer is running fast, the song will speed up. If the wearer is slowing down, the song will slow down and extend the agony. The build uses an Arduino and [ladyada]’s wave shield coupled to an accelerometer. [gvillenave] included the code, and also wired up some LEDs to a pair of sunglasses that blink more often as the runner’s speed increases. The wave shield has a 3.5mm jack for headphones, but [gvillenave] graciously wired a speaker in, “so that you can annoy people around you, and not just yourself.” All this is packaged in a very nice 3D printed enclosure making for a great looking project. There’s no word on the effectiveness of the negative reinforcement aspect of [gvillenave]’s build, but we suspect it will help her get down to the bus stop a little faster every morning. [Aaron Rasmussen] and his friend [Eli] slapped together this setup to see what it would be like to run as much as their World of Warcraft characters. 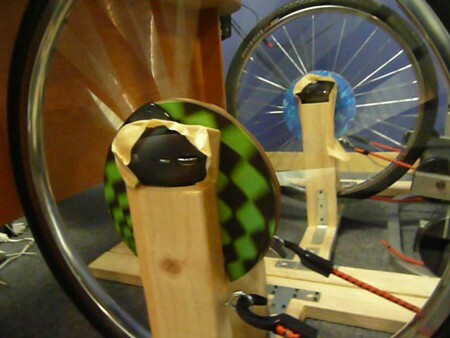 They used a couple old treadmills to spin some tires with makeshift mouse sensors on them. As their speed increased, so did their character. There was a decent amount of math done to figure the average speed of a World of Warcraft character, and ultimately they settled on 12 miles per hour. Not surprisingly, they found that too difficult due to the resistance in the rig as well as being out of shape. They ended up lowering the speed required to make their character go full sprint to 6 miles per hour. Their final conclusion was that they could never run as much as their digital counterparts. Even if they were in really good shape. [Aaron] does say that it was fun enough to consider doing it regularly as a workout plan. He should wear the costume every time he uses it.